Mary Elizabeth Garrett was America’s wealthiest female philanthropist in the late 19th and early 20th centuries. She had a tendency toward “social activism” and continued her father’s financial support of Johns Hopkins University. 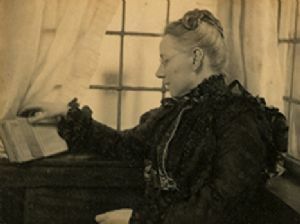 She provided critical financial backing to start its School of Medicine, but with a stipulation that female students be admitted on the same terms as men, thus initiating Johns Hopkins as the first co-educational university teaching center for women physicians. Mary Garrett worked to establish the Bryn Mawr School in Baltimore, a preparatory school for girls. She became one of largest benefactors of Bryn Mawr College, near Philadelphia, contributing more than $350,000 to keep the fledgling college solvent during its lean years and served as its Director from 1906-1915. She also financed the Women’s Suffrage movement, and is considered to have been the nation’s largest backer of women’s causes. Her father, John, served as president of the Baltimore and Ohio Railroad and has the distinction of having a Maryland county named after him. John Garrett maintained a cottage in Garrett County. He and his descendants had a major presence in the county and impact upon its development. Text - Albert Feldstein, photograph - Frederick Hollyer, London. “Will There Ever Be a Monument? - Recognizing Mary Elizabeth Garrett’s Role in Shaping American Medicine”, a speech by Kathleen Waters Sander, presented to the Task Force on Women's Academic Careers in Medicine, Johns Hopkins University Department of Medicine, June 13, 2001. “History Etched in Silence – The Life of Mary Elizabeth Garrett”, Baltimore Sun article by Jamie Stiehm, May 28, 2004. “Honor The Women Who Made It Happen”, Baltimore Sun article by Signe Lauren, March 29, 2007.
image - Bryn Mawr College, Pa.